PCS Home Page Contact Us! E-Store Practical Card Solutions represents the best manufacturers. We can provide the best combination of features, quality, delivery time and low prices to provide our customers with value, an optimal and ... practical card solution. 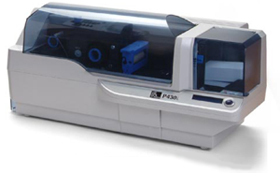 The Zebra ZXP 3i is ideal for applications requiring production of full-color plastic cards. Printing single-sided, personalized plastic cards has never been simpler, faster, or easier. we sell for less - call us for custom configurations and discount for your requirements. For a complete Color ID Solutions with ZXP Printer and Card Studio ID Design Software click here now,,,,,pdf. The Zebra ZXP 1 plastic card printer is highly versatile, and designed for smaller volumes or card printing in color or monochrome. To learn more about the Zebra ZXP 1, Click here..."Zebra ZXP 1.pdf"
The Zebra P430i can be used to create, print and personalize plastic cards. Print in full color on the front and black on the back. 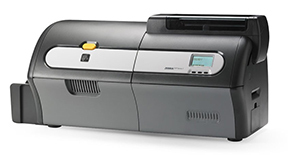 Designed for double-sided edge-to-edge color printing, the P430i produces rich, vibrant color, with 300 dpi resolution for precise readable bar codes, photos, graphics, and text.